All good things must end, says the old adage. 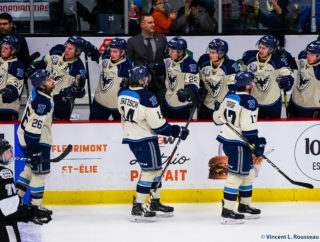 The Voltigeurs have finished Sherbrooke’s run of five home wins with a 6-5 victory this Saturday at the Palais des Sports. 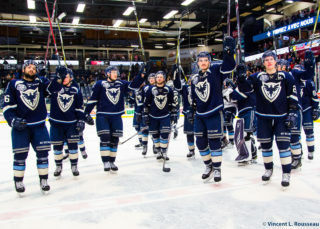 The match started badly for the Phoenix, who were dominating 15-7 in shots. Joey Ratelle (twice) and Nathan Hudgin took the opportunity to thwart Evan Fitzpatrick who had done nothing wrong in any of the three goals. The Phoenix showed up with a new dose of energy in the second period. 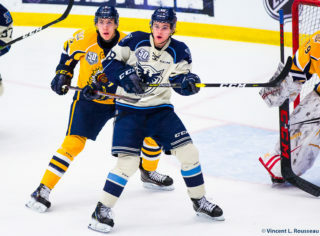 Félix Robert led the charge with his second in the QMJHL and Captain Carl Neill cut the lead to one goal with his fourth of the season. The Phoenix completed the comeback in the beginning of the third. Jason Imbeault redirected a shot from Carl Neill to tie and Hugo Roy grabbed a loose puck on the power play to make it 4-3. Charley Graaskamp allowed his team to return to the game with a goal midway in the third, then Pavel Koltygin gave the lead to his team. Joey Ratelle rounded out the Drummmondville scoirng to make it 6-4, then Julien Pelletier cut the lead in vain with a superb strike off of a pass. 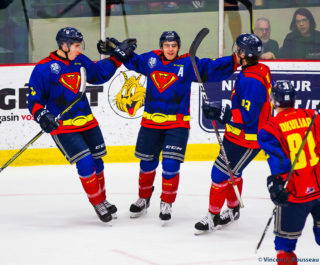 The Phoenix will Abitibi road early this week to face the Foreurs and there Huskies, Tuesday and Wednesday! Click here to see more photos of the Phoenix on facebook.